Yet another year is over. 2016 was an incredibly busy year for midPoint. 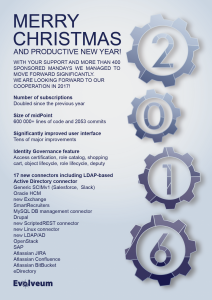 Lots of new midPoint deployments and projects. But most importantly the midPoint itself has significantly evolved. MidPoint is firmly based in the identity governance now. First half of 2016 produced midPoint 3.4 “Heisenberg”. Heisenberg includes a lot of new features. But one improvement overshadowed almost all of them: the user interface. We have received a lot of kudos for that. New user interface was a major leap forward towards usability. Second half of 2016 was dedicated to midPoint 3.5 “Einstein”. The release of Einstein was a real exercise in flexible planning. We have secured funding for a number of sponsored features quite late in the development cycle and we had to adapt the plans to make it possible. But we have done it. Einstein was released shortly before Christmas. It includes a lot of new features that turn midPoint into a practical identity governance system. Even though the release is still fresh there is a lot of potential in it. All that was a huge amount of work. But there is still more. We had been secretly working on something that we have unveiled at Christmas: midPoint book. This is our gift to the midPoint community. It is a way how to thank you all. Knowing that you are there was a great motivation for us. It is 2017 already. And it is time to look ahead. We have very ambitious plans for 2017. And we hope that we can make it a reality. However, we will need you to make that happen. As always. I’m really looking forward to it. This entry was posted in Community and tagged 2016, book, governance, midPoint. Bookmark the permalink.